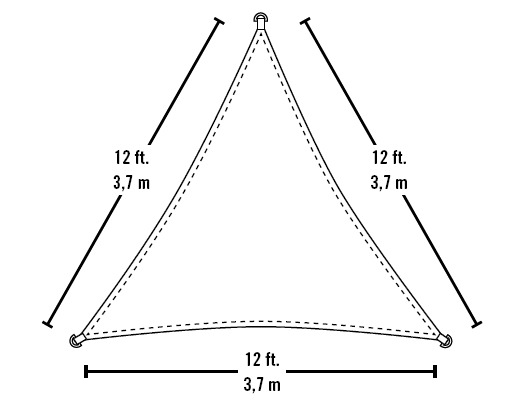 Getting a 12 Foot Shelter Logic Triangular Shade Sail is one of the easiest ways to provide shade for your outdoor living space. This patio accessory is, in essence, a large piece of tough polyethylene fabric with reinforced corners and steel fittings that allow it to be mounted to your home, trees, and a variety of other structures. Set up and take down literally take just a few minutes. If you're looking for portability, a Shelter Logic Triangular Shade Sail could be a good choice as well. This twelve-foot model, along with all of the required hardware, weighs less than five pounds. You could easily place it in the bag containing all of your picnic goodies and not even notice it was there. And, for those of you on a tight budget, you'll be happy to know that a shade sail is one of your least expensive shelter options. Because they are so simple and have so few pieces, these outdoor accessories cost much less traditional canopies. Of course, they're not as strong as full structures, but if all you're interested in is some temporary shade while you spend the afternoon outdoors, a shade sail is going to be one of your most convenient and cost-effective choices.